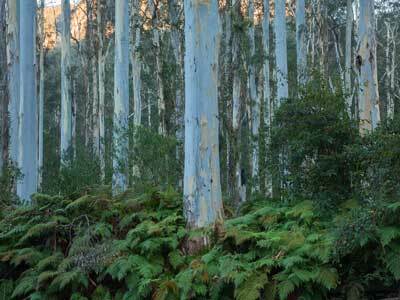 The wet sclerophyll forests of the Greater Blue Mountains contain majestic stands of straight-trunked eucalypts towering above a lush, green understorey. These forests are restricted to sheltered slopes and gullies where deep soils provide the moisture and nutrients they need. 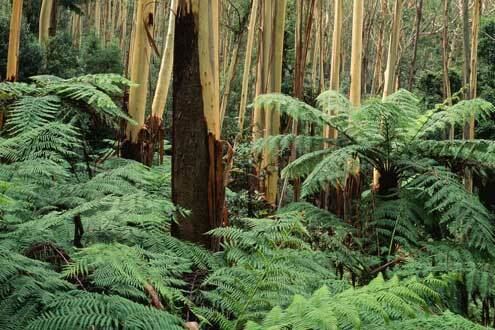 Wet sclerophyll forests occupy just over 6% of the Greater Blue Mountains landscape. They occur in areas of moderately fertile soil on sheltered slopes, in gullies and on alluvial flats, and may have either a mesic shrubby or grassy understorey. There are four classes of wet sclerophyll forests in the Greater Blue Mountains; they differ in canopy eucalypt and understorey composition and structure depending on the altitude, climate and soil. With increasing shelter, moisture or soil fertility these forests grade into rainforest and with decreasing shelter or moisture they grade into dry sclerophyll forests. The impressive Mountain Blue Gum (Eucalyptus deanei) forests of the Grose Valley, lower Blue Mountains diatremes (vents of ancient volcanoes now filled with weathered, volcanic rock), and alluvial flats (sometimes with Sydney Blue Gum, Eucalyptus saligna) along the eastern side of the Greater Blue Mountains fall within the shrubby North Coast Wet Sclerophyll Forests class. Large Turpentine (Syncarpia glomulifera) trees feature in these forests, as do mesophyllous shrubs and small trees, which form a multi-layered understorey characteristic of the shrubby subformation. 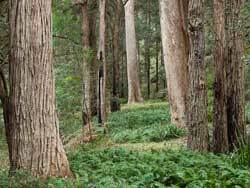 In the Greater Blue Mountains these forests are close to their southern limit; they occur more extensively along the central and north coasts of NSW. 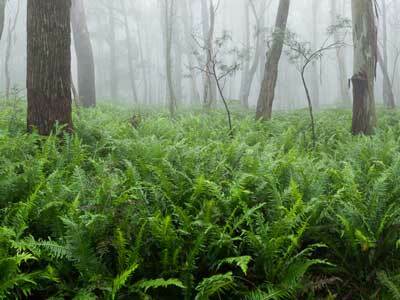 Another shrubby class, the Southern Escarpment Wet Sclerophyll Forests, occurs on the higher ranges in the south-western part of the Greater Blue Mountains. These forests are found on moderately fertile soils derived from granite or basalt at altitudes where orographic rainfall and a cool climate provide the moist conditions they require. 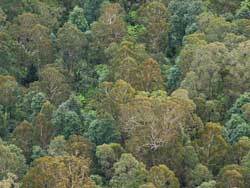 The canopy includes tall Monkey Grey Gum (Eucalyptus cypellocarpa), Brown Barrel (Eucalyptus fastigata) and Rbbon Gum (Eucalyptus viminalis), which occur in mixed or pure stands, while the understorey includes mesic shrubs and ferns. These forests are found in Kanangra-Boyd National Park, but often lack large, old trees as much of this vegetation was heavily logged prior to reservation. The Northern Hinterland Wet Sclerophyll Forests, one of the classes in the grassy subformations in the Greater Blue Mountains, are tall, semi-mesic forests dominated by Grey Gum (Eucalyptus punctata), ironbarks and turpentine. They are restricted to moderately fertile soils on the northern and eastern foothills of the ranges in Yengo National Park and on the top of the Lapstone monocline on shale-capped ridges. Due to their somewhat drier habitats, these forests do not support a fully developed mesic, shrubby understorey; instead they have a prominent ground cover of grasses with a mix of sclerophyllous and mesophyllous shrubs. They intergrade with the shrub/grass dry sclerophyll forests of the coastal valleys. 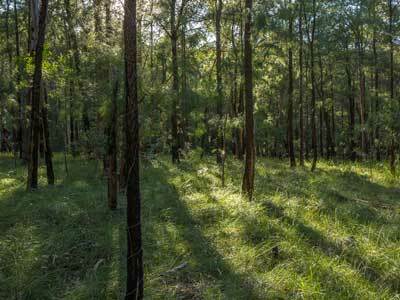 The Southern Tableland Wet Sclerophyll Forests are found at higher altitudes and are also characterised by a grassy, herbaceous understorey. These forests occur in high rainfall areas on moderate to high fertility soils of the tablelands, including areas in the south-western part of the Greater Blue Mountains. Small patches occur on the limestone around Jenolan. The majority of these forests that once occurred in the Oberon area have been cleared for pasture or pine plantations. Small areas of Blue Mountains Shale Cap Forest (endangered) and Blue Mountains Basalt Forest (endangered) occur within the GBMWHA. 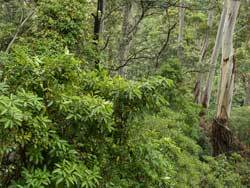 The Sun Valley Cabbage Gum Forest (critically endangered) occurs in a single diatreme in the lower Blue Mountains, outside the GBMWHA. 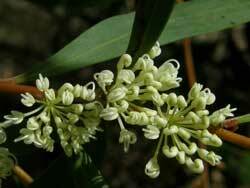 Its bell-like 2-3mm long sweet smelling flowers identifies this 2m tall leggy shrub. 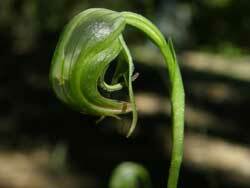 Identified by its dull flat leaves that have obscure veins, and warty fruit that has an upturned beak. One of the more easily recognised Greenhoods due to its nodding stance. The 3-6 leaves of its rosette have scalloped edges. This Wet Sclerophyll Forest of Blue Mountains Ash (Eucalyptus oreades), Cedar Wattle (Acacia elata) and Pittosporum undulatum, is grading towards rainforest under the influence of basalt soils. Tree-ferns and blue-green crowns of Cedar Wattles (Acacia elata) are growing up beneath towering emergents of Mountain Blue Gum (Eucalyptus deanei). Turpentines (Syncarpia glomulifera) dominate this sheltered riverbank forest beside the Capertee River.